Contemporary transnational criminals take advantage of globalization, trade liberalization, and emerging new technologies to commit a diverse range of crimes, and to move money, goods, services, and people instantaneously for purposes of pure economic gain and/or political violence. This book captures the importance of transnational business crime and international relations by examining the rise of international economic crime and recent strategies in the United States and abroad to combat it. The book is organized into three main sections. The first part discusses substantive crimes, particularly tax, money laundering, and counter-terrorism financial enforcement; transnational corruption; transnational organized crime; and export control and economic sanctions. The second part discusses procedural aspects of international white collar crime, namely extraterritorial jurisdiction, evidence gathering, extradition, and international prisoner transfer. The third part discusses the role of international organizations, including the United Nations, the World Bank Group, INTERPOL, and economic integration groups. “International White Collar Crime fills an important gap in treatises on white collar criminal law. The international emphasis of this work greatly expands the ability of practitioners, judges, and students to grasp legal and practical issues specific to white collar crimes extending beyond the borders of the Anglo-American legal system. The relevance of the cases selected for discussion is timely and current and significantly updates the scholarship on white collar crime in a manner that provides a seamless continuation of the constantly evolving field of white collar criminal law. Of particular value is the treatment of the role of non-government organizations in the regulation and monitoring of international white collar crime, with emphasis on the intrinsic connection of white collar crime with the international economy. Also useful, especially for prosecutors here in the United States, is Mr. Zagaris’ detailed discussion of the role of international enforcement networks and enforcement sub-regimes, in the course of which he brings together the collective knowledge of experts in international white collar criminal law to provide astute analysis and insights for his readers to understand better the challenges and the solutions lawyers and judges need to know in order to contend with the actions of transnational actors involved on both sides of international white collar crime. 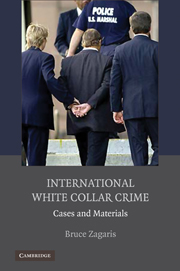 Click here to purchase Bruce Zagaris' book International White Collar Crime from Cambridge Press. Click here to purchase Bruce Zagaris' book International White Collar Crime off of Amazon.